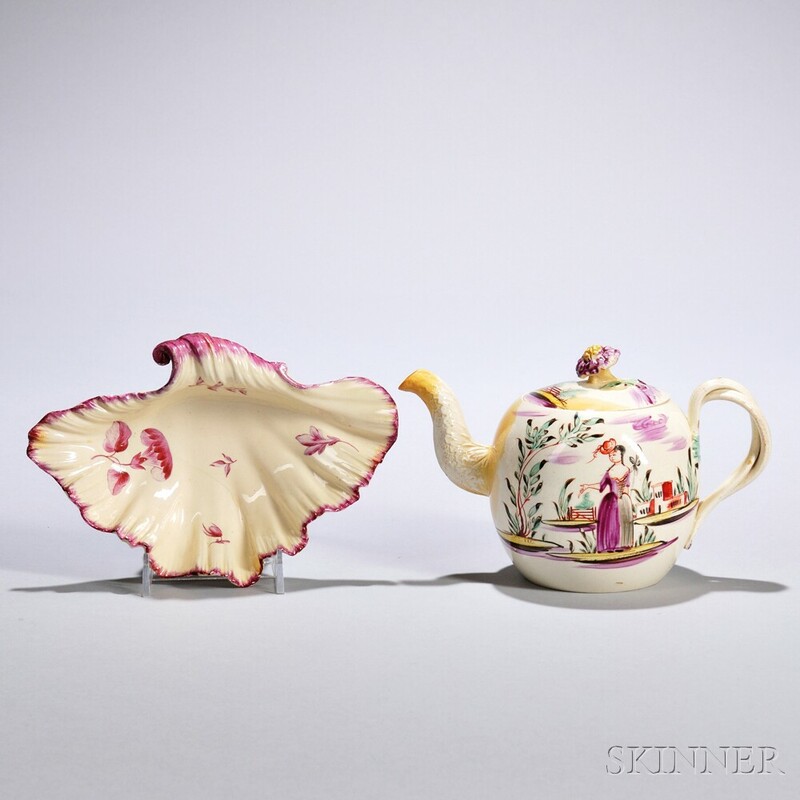 Two Creamware Table Items, England, c. 1770, attributed to Josiah Wedgwood, an unmarked shell-form dessert dish, rose/purple decorated trim and central floral motifs, set on two spiral shell feet, painted script "G" possibly to identify the artist as Thomas Green, lg. 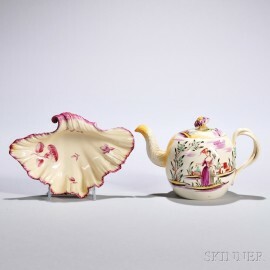 7 1/8; together with an impressed Wedgwood globular shape teapot and cover with double entwined handle, floral knop and molded cabbage leaf spout, overglaze polychrome enamel-decorated in the manner of David Rhodes with well dressed maiden in a landscape to one side, the reverse with towered building in a landscape, lg. 7 1/4 in. Literature: Identical dish illustrated in Creamware, by Towner, illus. 13A; similar teapot illustrated in British Teapots and Tea Drinking, by Emmerson, illus. 64. Dish: 1/2 and 3" hairlines repaired; scattered small rim chips repaired and numerous nicks surrounding edge. Teapot: All repairs old and discolored; cover to knop at join, and to two places at rim. Pot to body surrounding spout and to end lof spout.